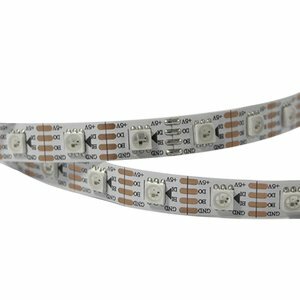 RGB LED strip which consists of SMD5050 WS2813 LEDs (with controls, IP20). WS2813 is an updated version of WS2812B strip with double data transfer line. If one LED goes out of order the rest of the LEDs will continue working. SMART strips are used for creating decorative lighting, as well as in video screens and information boards inside buildings. These strips can be controlled with any SMART strip controllers: autonomous (offline), slave (online), music and lights and programmable (remote control). Programs are either saved onto an SD card (offline) or are transmitted via Ethernet protocol (online). LedEdit or LedBuild applications are used for creating SMART strip programs.